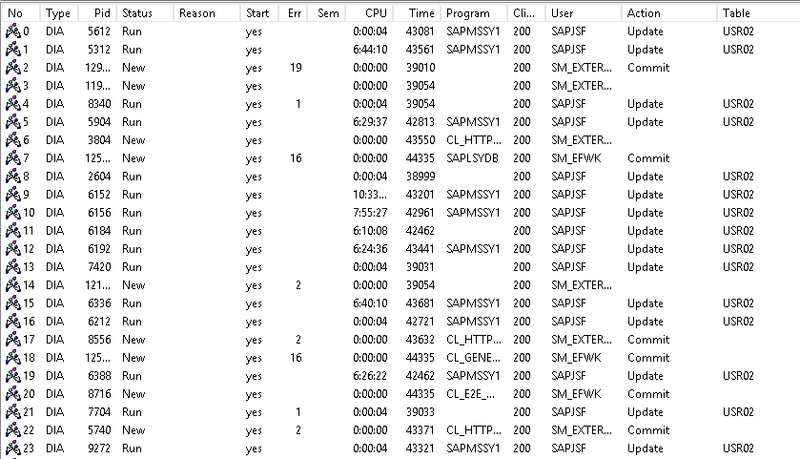 I have got a problem in SOLMAN 7.1 SP14 where when we did some mass changes in SOLMAN Portal & communication user SAPJSF occupied all the process. No one is able to login into system. We have tried killing process but it’s not successful. As per the trace we found below error. *—-> Stack Back Trace <----* 000000000203FAC0 000000014195DA49 0000000003423520 disp+work!DumpStacks [ntstcdbg.c (566)] 000000000203FBC0 000000014028B744 0000000143333F30 disp+work!NTDebugProcess [ntstcdbg.c (400)] 000000000203FBF0 0000000140146570 000007E000013B76 disp+work!CTrcStack [dptstack.c (183)] 000000000203FD40 0000000140100BE0 0000000000000000 disp+work!ThRollOut [thxxmem.c (1747)] 000000000203FDF0 000000014011C693 FFFFFFFFFFFFFF00 disp+work!ThIErrHandle [thxxhead.c (12046)] 000000000203FE50 0000000140030FB9 0000000003423088 disp+work!ThStart [thxxhead.c (1185)] 000000000203FEF0 00000001400010B1 FFFFFFFF00000001 disp+work!DpMain [dpxxdisp.c (1198)] 000000000203FF20 0000000141CAD2F0 0000000002040000 disp+work!nlsui_main [thxxanf.c (80)] 000000000203FF50 000007FF9F4B1842 0000000000000000 disp+work!__tmainCRTStartup [crtexe.c (594)] 000000000203FF80 000007FFA0EEE379 0000000000000000 KERNEL32!BaseThreadInitThunk 000000000203FFD0 0000000000000000 0000000000000000 ntdll!RtlUserThreadStart ----------------------------------------------------------------------------------------------------- As per SAP there is 1 note for the same. 1885942 - Work process is assigned obsolete request We are running on Kernel 721 SP 600 & this note is not relevant to our patch level but as per SAP we need to below parameter because as of 720.710 or 721.330, premature logoffs are detected in the dispatcher, too. To activate it, you must set the following profile parameter: “rdisp/dp_check_logoff = 1“ So even if you are on PL600 the parameter rdisp/dp_check_logoff = 1 needs to be set manually to your default or instance profile.